Swatches: Barry M Dazzle Dust - Cherry Colors - Cosmetics Heaven! Last week I got a nice package of Barry M Dazzle Dust pigments from Licila.si (they're selling Barry M cosmetics in Slovenia). Sadly mine are just testers, so they came without a cap (and that broke my heart because I had to decompose other pigments to get the caps ;_;), but they kindly included their Shimmering Eye&Lip Crayon. I got 10 of them. I have been using this pencil on top of my UDPP, and let me tell you.. the shadows came out so much vibrant (UDPP kills them, but keeps them placed on)! The pigments are mostly nice and gentle, but here and there, there are some rougher but not enough to make a big difference. 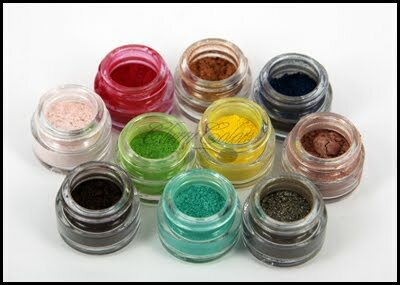 The apply nicely, blend in heavenly and are very pigmented. Okay except the light green. That is a weird/interesting shade that becomes yellow if you put too little of it on. Which could always be good. All of them need a base, because they do not stick alone well. But that's how most mineral pigments are anyway. The swatches are made on top of Barry M Shimmering Eye&Lip Crayon. Overall I do like these shadows, because they stayed on my oily lids intact for 12+ hours. And trust me, that is a big achievement. Expect some tutorials/eotds with them in the next few days.